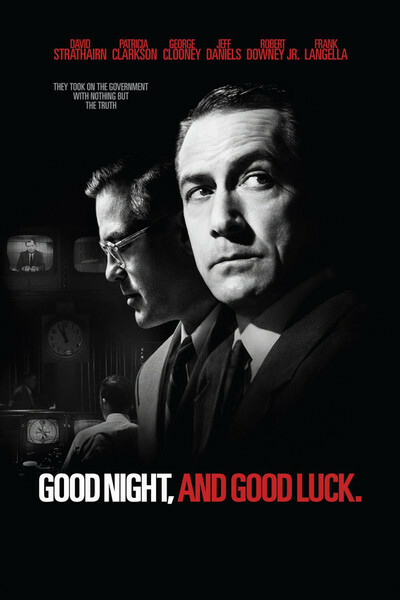 One aspect of this 2005 film, directed, co-written, and starring George Clooney (he’s not just a pretty face), is that it is a historical piece focusing on the United States in the 1950’s when a political witch hunt, led by Senator Joseph McCarthy, went beyond its original purpose to root out communist infiltrators, and targeted innocent people. 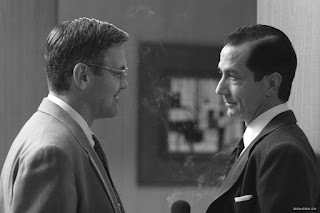 But, there are aspects of this movie which are very relevant to the present concerning abuse of power by politicians and the role of the media. 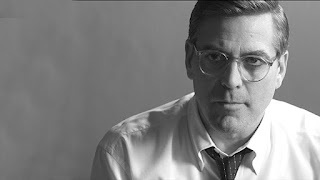 Clooney shot the movie in black and white, and that choice brings authenticity to the production since during the time period in which the story takes place, television shows were primarily colorless. Viewing it now makes the audience feel as if it is witnessing something historical. And the battle between renowned CBS journalist Edward R. Murrow (David Strathairn) and McCarthy was definitely one for the history books. 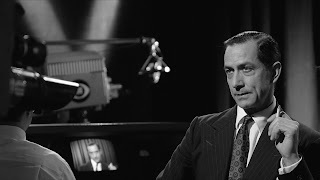 Also, real footage of McCarthy was used, which not only adds realism to the film, but also makes sense, since it was the senator’s public self, which the population viewed on their TV screens, that Murrow was targeting. It almost seems difficult to believe, especially for younger people, that at this time, there were only three major network news sources that provided stories, for the most part, during only a small portion of the day and in the early evening. The nation relied a great deal on finding out about events by reading the daily newspapers. The television reporters came from journalism schools, and had to be of the highest caliber in their field to make it to broadcast news. And, because there were so few information choices, unlike the deafening onslaught of amateur news outlets today, the impact that one TV news personality could make was substantial. At the time, journalists were supposed to present the news objectively without personal interpretation or subjective observations. 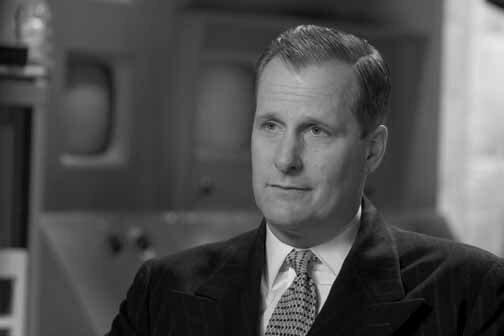 A newspaper would offer the management position only on the editorial page, and not in the writing of the news stories, and similarly, local news stations and national networks would wait to the end of their broadcasts to present commentary (Eric Sevareid was the go-to man for this job at CBS). Even though all of this neutrality has been replaced by personal viewpoints on most of the news programs, and even outright propaganda espousing, it was a big deal in the early 1950’s for Murrow to attack a United States senator. The story is bookended by the dinner tribute to Murrow on Oct. 25, 1958, years after the confrontation with McCarthy, and it allows Clooney to present the journalist's respected reputation in the introduction to his appearance at the event. We are told Murrow was in the middle of World War II, broadcasting from Britain during Hitler’s bombardment of that island. 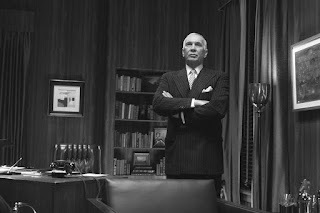 He also did groundbreaking stories on segregation and the exploitation of migrant workers, which shows his concern for the underdog, and investigative work on then FBI Director J. Edgar Hoover. But, Murrow does not present a speech of gratitude. Instead, he sort of bites the hand that feeds him, criticizing, prophetically, television’s problems. He says that the mass media, and in particular television, “is being used to distract, delude, amuse, and insulate us” from the realities of the world. 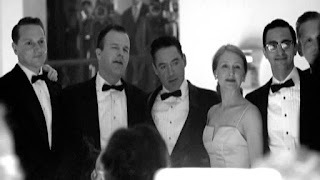 There is a subplot story concerning news department workers Shirley Wershba (Patricia Clarkson) and her husband, Joe Wershba (Robert Downey, Jr.) which comments on the main narrative thread. The network has its own oppressive rule which prohibits co-workers from marrying each other. So these two try to keep their marriage secret, although we learn everyone seems to know the truth about them. The sanctions concerning their relationship seem to be part of a general state of control over individual freedom, as is illustrated by the fact the two talk about having to sign a loyalty oath mandated by CBS. If it is not signed, jobs will be lost. Even Murrow and his producer, Fred Friendly (Clooney) have signed it. This requirement shows how far the politics of fear has already spread. Murrow first wants to investigate an officer released by the Air Force because his father read a Serbian newspaper, and who was thus considered to have ties to the Communist Party. There was a regulation which stated a person was a security risk if he or she associated with someone with communist connections. The Air Force required that the airman renounce not only his father, but also his sister. Friendly asks Murrow why he is taking on this story since it doesn’t have to do with McCarthy. Murrow emphasizes the reach of the witch hunt when he says, “Isn’t it?” The “evidence” against the officer is sealed, so the man hasn’t even had the opportunity to examine it, and try to refute it. Two colonels show up at CBS to demand that the network not air its piece without prior authorization. Friendly makes it clear that censorship is not an option. The military’s self-righteous stand is that only they can determine whether or not a person is a security risk, and the press has no say in the matter. This attitude of course is the argument that national security matters outweigh the freedom of the press. Many would agree that under certain circumstances the government must keep information secret for security purposes. But, here evidence against someone who they are accusing of being an enemy sympathizer is not classified information, and is only a smokescreen to prejudicially separate a man from his family because of assumed beliefs. Murrow’s immediate boss, Sig Mickelson (Jeff Daniels), argues against Murrow and Friendly doing a piece on the officer, for fear of retribution by McCarthy. Mickelson points out that Murrow’s sponsor, Alcoa, has defense contracts with the government that could be pulled as punishment for bucking the Air Force over a story with communist overtones. The intimidation is palpable. Murrow makes the argument against always presenting balance to a story because he says that “there are not always two equal and logical sides.” For example, can we really argue the positive side of Nazism? The dedication of these men is seen when Murrow and Friendly must put up their own money to air the show. In the midst of this drama, these men still show a sense of humor. When Murrow says Friendly won’t have any funds for presents for his kids on Christmas, Mickelson says of Friendly, “He’s a Jew.” Murrow responds, “Well, don’t tell him that. He loves Christmas.” Also, just before airing the piece, Freindly jokes that he told the military he didn’t want to do the story. 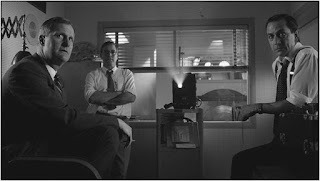 Murrow says that Friendly was always “yellow.” Friendly says, “Better than being red,” playing off of the saying at the time of “better to be dead than red.” The Air Force eventually reverses itself after Murrow’s shining the light on its unjust act, which illustrates the power of a free press. Clooney adds some nice touches to show the power of television. He includes a commercial for Kent cigarettes. The salesman says he knows that the audience isn’t easily influenced by advertisements, but that manipulation is exactly what he is trying to do. The power to sway was eventually conceded, and cigarette ads are no longer aired. But, the scene stresses that TV can have a strong impact on the citizenry, as does any politician who uses media outlets. Murrow must do journalistic penance for the network by adding more segments of the popular show at the time, “Person to Person,” where he does remote interviews with celebrities. 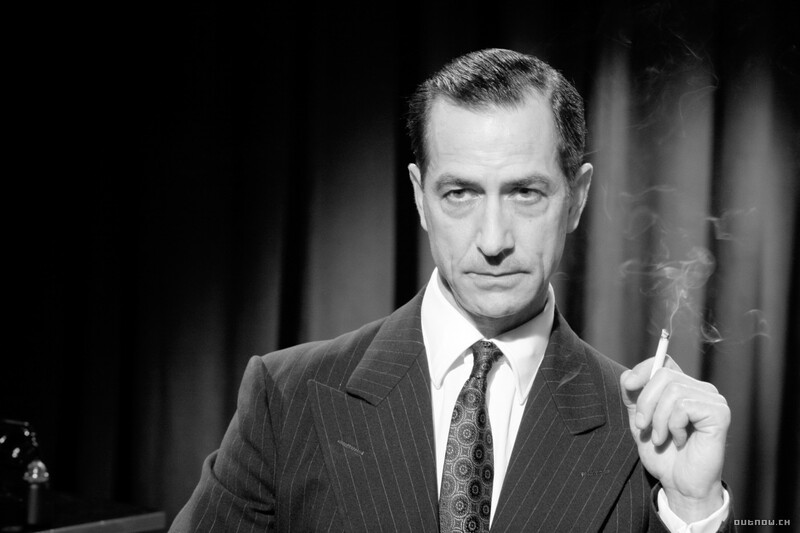 Strathairn (in an Oscar-nominated performance) gives a telling look to show his disdain after someone tells him that one of these shows was good. Murrow, as we heard in the opening speech, sees the use of TV for purely entertaining distraction as being a waste of the medium. 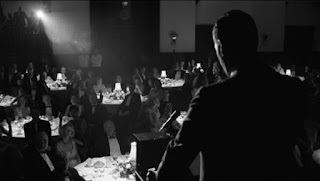 There is a segment where Murrow interviews Liberace, who is the real deal, just like McCarthy, and the pianist says, in response to a question about getting married, that he, like, Princess Margaret, is waiting for a “dream man, too.” Strathairn’s slight chuckle is perfect as it acknowledges Liberace’s slip concerning his closeted homosexuality, which also points to the repressive nature of the 1950’s. 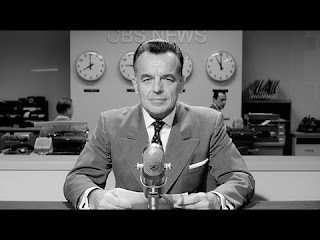 Also, the actor’s looks of concern for fellow besieged newsman Don Hollenbeck (Ray Wise) are right on the money. Hollenbeck can’t handle the collapse of his marriage and the onslaught of attacks labeling him a “pinko,” a communist sympathizer. 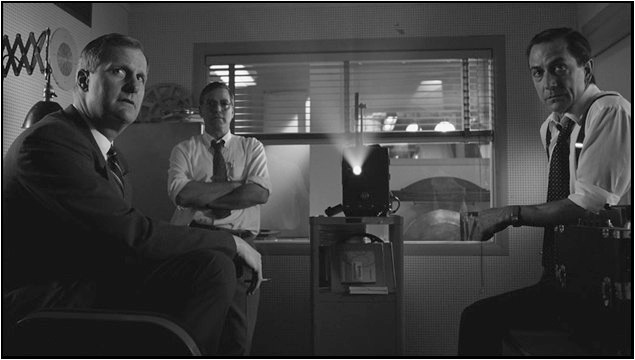 After Murrow tells him he can’t go after Hollenbeck’s enemies and McCarthy, too, Hollenbeck commits suicide. You can see the dejection and guilt in Murrow’s face as he absorbs the loss of his colleague. For him, McCarthy’s abuse of power, which destroyed lives, has hit very close to home. We hear the vocalist singing, “Somewhere there’s music, somewhere there’s heaven,” which underscores what Murrow might feel for Hollenbeck. He gives an on-the-air eulogy for Hollenbeck, emphasizing the man’s honesty, with the implied contrast with the deceptive people who attacked him. 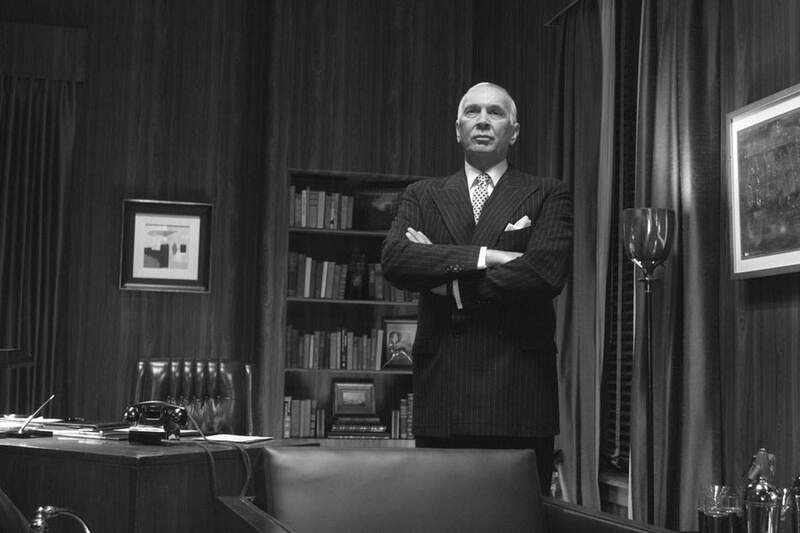 Murrow and Friendly must battle the head of CBS, William Paley (Frank Langella), who sympathizes with what the two men want to do, but who must deal with the government and sponsors. He advises them to let it go, because their stance may hurt their fellow employees if the government goes after them. Of course, it is just this persecution that Friendly and Murrow want to stop. Paley argues that the Senate will investigate McCarthy, and the problem will go away. He says that it isn’t the network’s job to try McCarthy in the press. But, Murrow has already granted that the senator will be given equal time to respond to any allegations made by CBS news. Some may say that his stance is fairer than what occurs today, where attacks in the media come in droves from all sides, and the task to defend oneself can be overwhelming. Paley acquiesces, but requires that all the staff undergo a rigorous background check to make sure there has been no contact with anyone with communist connections. One of the employees says that he didn’t know about it until after his divorce, but his ex-wife attended a Communist Party meeting, and he knows that this fact will be used against CBS. Murrow says which one of them didn’t attend some kind of meeting or knew someone that espoused some anti-establishment sentiment. He says that McCarthy’s “Terror is right here in this room.” In witch hunts, the hunter is scarier than the witches he hunts. On the March 9, 1954 broadcast, Murrow goes after McCarthy directly. Paley, in a funny phone call, asks Murrow if he’d go with him to see the Knicks play that evening. Murrow says he’s busy bringing down the network that night. Paley, probably wishing his joke about Murrow going to the game turned out to be true, says, “Oh, is that tonight?” In his commentary, Murrow says that “It is necessary to investigate before legislating. But the line between investigating and persecuting is a fine one, and the Junior Senator from Wisconsin has stepped over it repeatedly.” He argues, as many do now, that “We must not confuse dissent with disloyalty,” since without criticism, there is no free speech, and thus, no democracy. 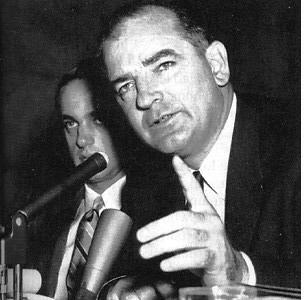 As to McCarthy’s tactic of presenting as fact what he pronounces into a microphone, Murrow says, “We must always remember, that accusation is not proof, and that conviction depends upon evidence and due process of law.” These words ring true even today, as each side of the political spectrum paints a picture of guilt involving opponents without fair scrutiny. Another line that reverberates today has to do with playing into people’s fears, instead of their better natures, since acting solely out of fear inhibits being able to evaluate the totality of a situation. Murrow doesn’t blame McCarthy for creating the atmosphere of fear of people who are different from those in the mainstream, “he merely exploited it,” which is what a demagogue does to gain power. The broadcast generally receives positive responses. Again, the actual footage of the hearings is more powerful than any recreation since there is no artificial interpretation or filter to alter what really happened. 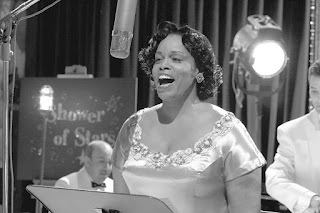 We see McCarthy intimidating the African American woman, Annie Lee Moss, who worked in a code room, saying it is accepted that she is a communist, because a FBI undercover agent said so. He states this as a fact, and says what he really wants to know is why she, a known communist, was placed in the code room. It appears that he is going after someone else in the government, but by doing so, he has disgraced this woman. Another senator finally speaks up, saying that Moss has lost her job, and is condemned through hearsay, innuendo, and rumor, without producing an actual witness to give testimony. He says once the character assassination takes place, it can’t be erased from the minds of the public, and “that is the evil of it.” He receives loud applause, and we can feel that the tide is turning away from McCarthy. 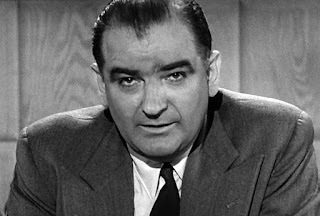 We view the famous speech which puts a nail in McCarthy’s political coffin, as he is asked, “Have you no sense of decency, sir?” The CBS newsroom hears that the Senate has decided to investigate McCarthy, which leads to censuring him. But, Murrow and Friendly have to pay a professional price for their defiant courage. Paley cuts back Murrow’s show from an hour to a half hour, moves it from weekday prime time to Sunday, and he will only be allowed to do five more shows. However, the two seem satisfied with what they have accomplished, and promise to go out with a bang in those last broadcasts. After a holiday week off, the next film will be Nuts.